A prank brings Sam to the attention of Douglas, a creepy guy with an intense violent streak. Turns out Douglas is a necromancer who raises the dead for cash and sees potential in Sam. Then Sam discovers he's a necromancer, too. Lish McBride grew up in the Pacific Northwest and got her MFA in fiction from the University of New Orleans. Lish lives happily in Seattle with her family, two cats, and one very put-upon Chihuahua. This is her first novel.
" McBride's humor and ear for dialogue carry the book. There's a "Mad"-magazine-meets- Twilight' sensibility to Hold Me Closer, Necromancer' that will keep readers turning pages and laughing all the way. "Los Angeles Times"
A fast-paced and fun first novel This is a welcome humorous addition to the paranormal trend. "The Oregonian"
The richness of the supernatural underworld, complete with politics, history, and personal vendettas, is another draw, and honorable, desperate, smart-alecky, clueless Sam is the perfect vehicle for entry. Readers seeking a thoughtful, original, and compelling supernatural adventure need look no further. "BCCB, STARRED review"
With fine writing, tight plotting, a unique and uniquely odd cast of teens, adults, and children, and a pace that smashes through any curtain of disbelief, this sardonic and outrageous story's only problem is that it must, like all good things, come to an end. "Booklist, STARRED review"
McBride pulls no punches and hits where readers will least expect it; the story can be gory and violent, but isn't gratuitously graphic. A solid start that concludes with the promise of Sam's power growing greater and darker, secrets getting deeper, and more fun to follow. "Publishers Weekly"
this quirky urban fantasy will compel fans of horror and supernatural romance--and heroic skateboarding slackers. "Kirkus Reviews"
Sam is the ultimate laid-back slacker who also happens to be smart, funny, sweet, and adorable. Every character in this book seems to live in the moment, offering sarcastic humor that lightens up the intense action and dark suspense. 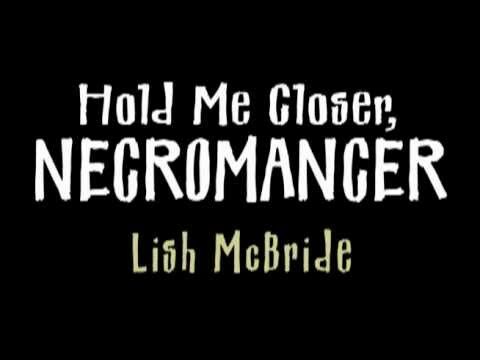 "Hold Me Closer, Necromancer" is entertaining, offbeat, hilarious, and flat-out fun. We loved it. "Justine Magazine"
Part scary, part funny, with a touch of tenderness, "Hold Me Closer, Necromancer" holds readers spellbound with unforgettable characters, snappy dialogue and killer (sometimes literally) song lyrics that open and offer clues to each chapter. Drawing on the timeless adolescent quest for identity and the popularity of supernatural fiction, McBride makes Sam's adventures a scream--and a hoot. "BookPage"" "McBride's humor and ear for dialogue carry the book. There's a "Mad"-magazine-meets-'Twilight' sensibility to 'Hold Me Closer, Necromancer' that will keep readers turning pages and laughing all the way." --"Los Angeles Times" "A fast-paced and fun first novel...This is a welcome humorous addition to the paranormal trend." --"The Oregonian"
"McBride pulls no punches and hits where readers will least expect it; the story can be gory and violent, but isn't gratuitously graphic. A solid start that concludes with the promise of Sam's power growing greater and darker, secrets getting deeper, and more fun to follow." --"Publishers Weekly"
..".this quirky urban fantasy will compel fans of horror and supernatural romance--and heroic skateboarding slackers." --"Kirkus Reviews"
"Sam is the ultimate laid-back slacker who also happens to be smart, funny, sweet, and adorable. Every character in this book seems to live in the moment, offering sarcastic humor that lightens up the intense action and dark suspense. "Hold Me Closer, Necromancer" is entertaining, offbeat, hilarious, and flat-out fun. We loved it." --"Justine Magazine"
"Part scary, part funny, with a touch of tenderness, "Hold Me Closer, Necromancer" holds readers spellbound with unforgettable characters, snappy dialogue and killer (sometimes literally) song lyrics that open and offer clues to each chapter. Drawing on the timeless adolescent quest for identity and the popularity of supernatural fiction, McBride makes Sam's adventures a scream--and a hoot." --"BookPage" "McBride pulls no punches and hits where readers will least expect it; the story can be gory and violent, but isn't gratuitously graphic. A solid start that concludes with the promise of Sam's power growing greater and darker, secrets getting deeper, and more fun to follow." --"Publishers Weekly"
"...this quirky urban fantasy will compel fans of horror and supernatural romance--and heroic skateboarding slackers." --"Kirkus Reviews"